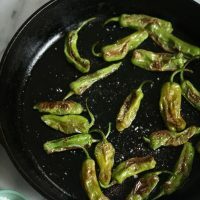 This Japanese shishito peppers recipe is sauteed until blistered and then topped with sumac salt. It's such an easy, healthy party appetizer. In a large skillet, heat the olive oil. Cook the peppers over medium heat, stirring once every minute, until blistered and soft, about 4 to 6 minutes. Toss the peppers with the sumac, salt, and lemon juice. Serve immediately.